TV Asahi's Good! 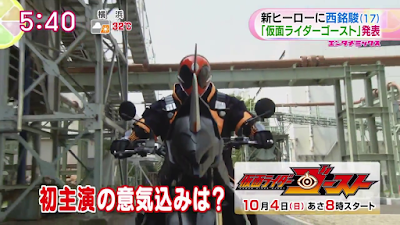 Morning TV show has our first look for the Kamen Rider Ghost series that took place in the press conference event. Seen in the segment is Takeru transforming into Ghost along with Ghost and Musashi Damashii form. Also seen in the video are the series's main cast and the band who will perfoma the intro for the series. Kamen Rider Ghost will premiere this October 4. Are you ready to get spooked? Musashi Form by the water. A nod to Musashi Miyamoto vs. Kojiro Sasaki? at 0:27 you can hear the "Batchirimina!" henshin sound and at the 0:38 the "Let's go! Kakugo!" wow another short main rider actor like gaim. as an asian i can relate that. It looks like the evil henchman of this series have their own belts! Im hyped bout everything, except his bike lol, but then again...it has the chameleon mod to it too.. Does his bike even have a headlights? Oh I forgot Ghost's face is the headlights..